Ford “will export vehicles from China to the U.S. for the first time starting in 2019,” said Dee-Ann Durbin in the Associated Press. 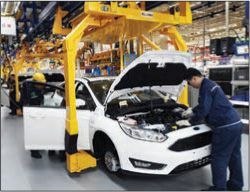 The company announced this week that it would move production of the Ford Focus from the U.S. to China, instead of to Mexico as originally planned. American automakers are seeking to cut costs in the production of small cars, sales of which have dropped sharply in the U.S. “Focus sales were down 20 percent through May, hurt by low gas prices and consumers’ preference for SUVs.” Wages are cheaper in China than in Mexico, and Ford already builds Focus cars in China for the local market. The Trump administration was uncharacteristically subdued in its response to the news, said Todd Spangler and Brent Snavely in the Detroit Free Press. On the campaign trail, Trump threatened “huge tariffs against any automaker that moved to import cars into the U.S. from other nations,” and singled out Ford in particular. But remarks this week from White House officials were more measured, with Press Secretary Sean Spicer saying Trump’s plan to lower corporate taxes will eventually lure companies back to the U.S. Ford has said its decision won’t cost any American jobs, because the Michigan plant that currently produces the Focus will be converted to build pickup trucks and SUVs. Uber founder and CEO Travis Kalanick abruptly resigned this week “under mounting pressure from investors over his leadership,” said Heather Somerville and Joseph Menn in Reuters.com. The unexpected decision came after five top Uber investors presented Kalanick with a letter pressing him to step down after a damning investigation into Uber’s corporate culture. Kalanick announced last week that he would take an indefinite leave of absence to work on his leadership skills, as well as grieve his mother, who was killed in a boating accident last month. For the first time, the former head of a major global bank is facing criminal charges for conduct during the financial crisis, said Caroline Binham in the Financial Times. British authorities this week charged ex–Barclays CEO John Varley, as well as three former senior executives, “with fraud related to the emergency cash injections that saved the bank from a government bailout” at the height of the crisis. The case centers on secret side deals with Qatari investors, “who plowed $12 billion into Barclays” in 2008. Barclays later paid fees and extended loans to Qatar that weren’t properly disclosed. Walmart is buying another trendy online clothing retailer as it courts upscale shoppers in its battle with Amazon, said Charisse Jones and Nathan Bomey in USA Today. The retailer announced last week that it’s buying Bonobos for $310 million, adding the stylish menswear brand to a growing list of acquisitions including women’s clothing retailer ModCloth and outdoor gear seller Moosejaw. There’s some concern that “Bonobos and Walmart aren’t tailor-made for one another,” with Bonobos CEO Andy Dunn admitting he has been “incredibly anxious” about how his company’s brand will mesh with Walmart’s.